The Arena of Valor server will be offline for maintenance on December 4, 2017 in preparation for a new update. All players will be unable to login to the game during this time. 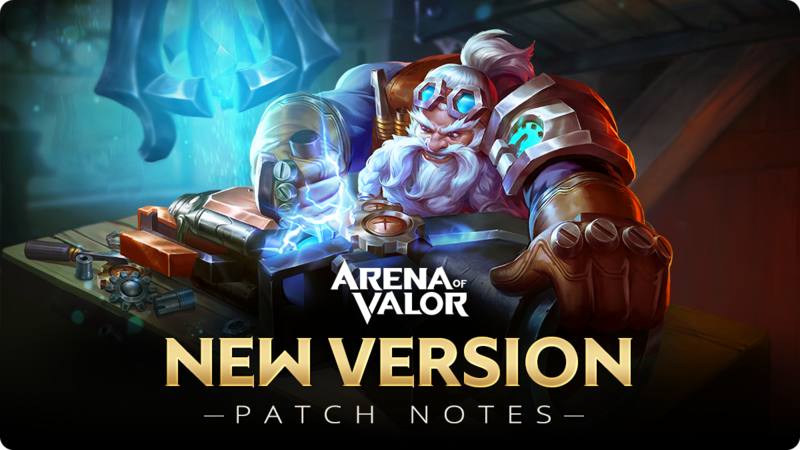 We do not have an estimation of how long the maintenance will last, but you can follow @ArenaofValor for the latest progress. We have rigorously analyzed and collected match data to make a series of balance adjustments to various heroes, equipment, and battle mechanics in this new update. Ranked Matches, matchmaking, social features, and more have also undergone continued optimization. We hope everyone will enjoy these enhancements to the game experience with the release of Beta 11! * Now when you search for a Friend, you no longer need to enter the full name. Search results will appear as you type. * You can now invite players to the game using Facebook Messenger. * Improved the standard PvP waiting screen in order to prevent cheating in higher ranks (e.g. active feeding). * During the Pick / Ban phase, you can no longer see the enemy team's player names. * Previously when a team was formed for a Ranked Match, a team of three would be grouped together in the Pick / Ban phase. Now, the other two teammates will be placed at random in the Pick order, rather than at the end. * Previously, at least one Brave Point was required to be earned in order to prevent a drop in rank. Now, depending on your rank, a certain amount of Brave Points will need to be earned to prevent a drop in rank. * In the Lobby, you can now invite players from the previous match to join your team. * In the Lobby, players can now choose to mark themselves Not Ready. As long as one team member is Not Ready, the leader will be unable to search for a match. * Every hero now has three recommended item builds, based on different situations. * A Gift Center has been added to the shop. Now you can gift Skins to friends that are higher than level 15. * If players choose, they can now set their gender in their profile, which will be displayed with a symbol before their name. * You can now broadcast your gameplay directly from the game. This is only supported on certain devices. Please see our FAQ page for this feature here. * Added the Highlight Reel. When enabled, the game will automatically record and generate a video at the end of the match to show off some of the outstanding moments from the match, which can be shared. Please see our FAQ page for this feature here. * Players can now delete several items in their Mail at once. * Improved the detection of active feeding behavior. * If your teammates play well, you can now let them know by giving a thumbs up in the Match Results screen. * Introducing the Weekly Legend Report! Facebook bots can view weekly game data to be shared with Facebook friends.